Its Purpose: To document and preserve Michigan's needlework heritage. Its Goal: To collect and inventory information showing Michigan's contribution to female education and needlework skills. The end product will be a publication and exhibit promoting the study of Michigan-made samplers, their makers and instructors. a conventional border framing the whole. The Michigan Sampler Survey is a non-profit organization. Its mission is to document, preserve and present Michigan's needlework heritage beginning with its first settlers to the year 1900. 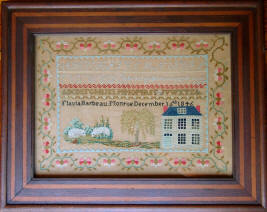 In recent years an in depth study has been made of New England, Southern, Ohio and Maryland embroidered samplers. Greatly overlooked has been Michigan's contribution to needlework and its role in female education. Our desire is to bring the school-girl needlework to life by researching its maker, their teachers, their families and their contribution to Michigan's pioneer history. This survey will include samplers in museums, historical societies and private collections. Two concerns often expressed with privately owned samplers are anonymity and confidentiality. Sampler scholars are not interested where an object is located, but in its existence. Privacy will be maintained. Owners of Michigan Samplers are encouraged to contribute to this important survey and documented samplers will be presented with a certificate stating their inclusion in this important study. 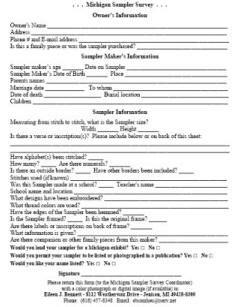 Please support and preserve Michigan's needlework heritage by filling in the attached form. Copyright 2006-2016 Western Michigan Genealogical Society. All rights reserved. Revised: January 18, 2016.